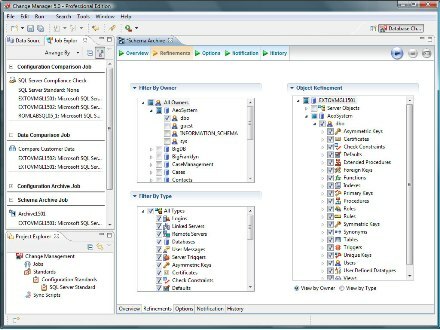 Change Manager 5.0 is a cross-platform SQL Server utility to identify database changes when migrating databases and diagnoses performance issues. 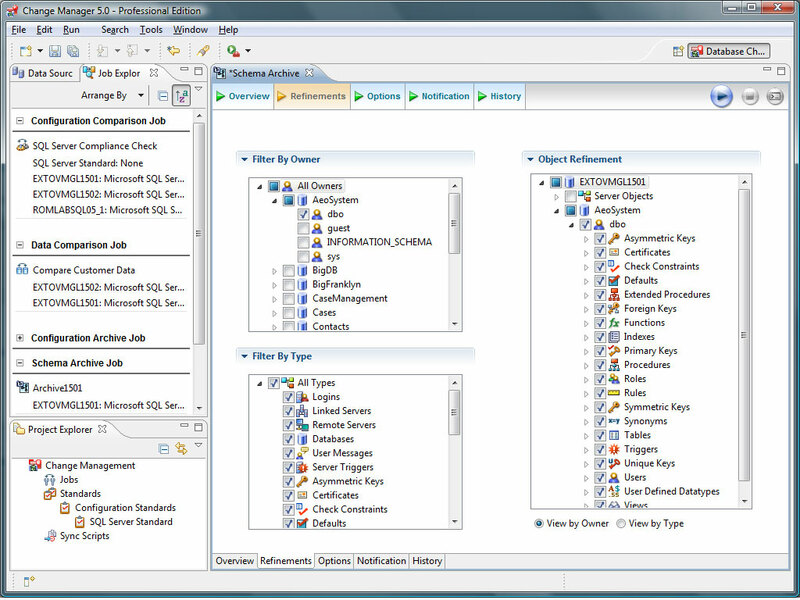 Embarcadero Technologies' Change Manager provides database management system support from a single user interface across all three areas of database change management: schema, data and configuration. Change Manager from Embarcadero Technologies Inc. enables users to report on database changes, roll out new releases and pinpoint database performance problems that result from planned or unplanned changes. Change Manager ensures that changes applied to the production environment are also applied to design, development and test environments. It provides the ability to take "snapshots" to capture database schema and proactively monitor databases for changes. The snapshots can be used to review, understand and roll back changes to ensure optimum database performance. A single cross-platform, cross-functional application that addresses all areas of database management and auditing. Flexible reporting formats, including HTML, .pdf files, XML, CSV and RTF. Enhanced email notification with new Eclipse/Java extension points for customized extensibility. An enhanced command-line interface with command-line generation wizard, multi-job execution with regex matching and ANT scripts generation. System requirements: Microsoft Windows XP Professional, Windows Server 2003 or Windows Vista (32-bit architecture only). Internet Explorer 6 SP1; 1 GB of memory and 500 MB of disk space; 1.2 GHz processor; 1024x768 16-bit display.